Tomato Consommé, Thyme for Cooking chilled first course soup. Heat the consommé in a saucepan until it 'melts'. 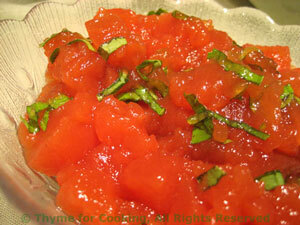 Add the tomato juice, stir well, remove from heat and chill well - at least 4 hours. To serve, ladle into soup bowls and snip some fresh basil leaves over the top. Add pepper and serve. Heat stock, water and Madeira in a saucepan. When boiling whisk in gelatin and whisk continually for 1 minute. Add tomato juice and let cool. Refrigerate at least 4 hours, stirring once or twice if you remember. If gelatin separates, just stir in.